Last November, we discovered that Skillet was negotiating to be the marquee tenant at the renovated Packard Building at 12th & Pine. In June 2010, we learned that Grey Gallery made an unsuccessful bid for the same space. 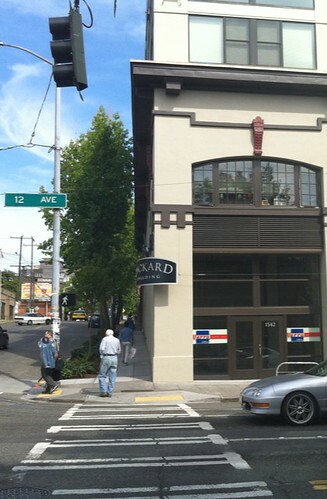 Today, we can confirm the tenants who will occupy the retail spaces fronting 12th Avenue at the Packard Building. When walking by the corner of 12th and Pine, you can already see the signs for Varro, an italian bar that was inspired by Federico Fellini’s La Dolce Vita. We spoke to Richard Troiani, a hospitality industry veteran, who conceived an Italian bar that serves espresso and coffee during the day and apertivos (including limoncello) and cocktails in the evening and night. Troiani and his partners plan to serve paninis and pastries, along with Lavazza Coffee. If Troiani’s name sounds familiar to you, it may be because his name used to grace the space at 1001 3rd Avenue, back when it was an Italian steakhouse and where he once served as the Managing Partner. Troiani hopes to open Varro mid-November. Next door to the south, Stephen Brown and his partners will open Eltana, a middle eastern eatery that will serve wood-fired baked bagels known as “Montreal bagels”. 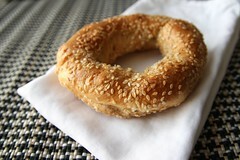 Montreal bagels are smaller, sweeter and coated with either sesame or poppy seeds all over the bagel (rather than on one side). The bagel maker at Eltana will have an impressive pedigree, having made bagels at St. Viateur’s Bagels, the renowned Montreal bagelry. The wood-fired stove will sit in the center of the space, so customers can view the bagels emerging fresh from the oven. Brown shared with CHS that Eltana will have an otherwise limited menu carrying no more than 15 items of middle eastern spreads, salads and soups. He described the menu as consisting of middle eastern street food and envisioned it topping off at $12. Brown is a restaurant veteran having helmed Entros, an “intelligent amusement park” / restaurant in South Lake Union from 1993 to 2000. Before that, he operated an oyster bar in Palo Alto. Eltana hopes to open sometime between Thanksgiving and the end of the year. The space that Toriani used to occupy downtown on 3rd and Madison still sits empty. There was talk of Sharp’s Fish Market moving in- but as of yet, the space is empty. I’d love to see a place serving espresso with table service, like the ones I remember from the North End in Boston…maybe they’ll do that here? Since Crave left, I’ve missed having a cafe on our northern stretch of 12th Ave – Varro sounds perfect. A Canadian friend said that St.Viateur’s in Montreal is one of the best (the “temple”), so we’ve got high hopes for Eltana as well. I love real Italian coffee!! Very refreshing. Looking forward to it….now if I could only have a smoke with my espresso………………. Thanks for your comment. Yes! Varro will have table service for espresso and everything else on the menu from morning to night! In the meantime, you should follow Varro on Twitter at twitter.com/varrolife and on facebook!! Thanks, Josie!! Ahhhh!!! St. Viateur bagels in Seattle!! I grew up on those bagels and have been singing their praises and driving trunk-fulls of them back from visits to Montreal (St. Viateur) and Vancouver (Siegels) to keep in my freezer ever since. Hoorah for REAL bagels in Seattle! Are we really going to see some cool nightlife? so nice to see vacant spaces on the hill finding unique and interesting tenants. italian coffee and montreal bagels sounds like a winning combination. here’s hoping the north end of broadway can undergo the same kind of revitalization that seems to be taking place in the 12th & pike/pine area.